Cambodia's Prime Minister Hun Sen waves upon his arrival at Air Force Station Palam in New Delhi, India, Jan. 24, 2018. An Australian parliamentarian says he has sought the intervention of federal police in response to threats from Cambodian Prime Minister Hun Sen to beat citizens of the country on their home soil. At the summit, hundreds of protesters are planning to confront Hun Sen, who has ruled for more than three decades and recently had his country’s only viable opposition party dissolved ahead of elections in July. Before that he vowed to kill several hundred people if necessary in order to win the ballot and has orchestrated a sweeping, prolonged assault on the media, civil society and political opponents. The premier’s inflammatory remarks this week came as Germany imposed punitive measures in response to these actions while the EU Council is reportedly about to request sanctions and a review of Cambodia’s crucial preferential access to their market. In his speech Wednesday Hun Sen also threatened his would-be Australian hosts that he will “leave shame on the face at the scene” if they dare treat him inappropriately. Cambodian-Australian Hong Lim, a veteran MP in the Victorian state parliament, said he contacted Australian Federal Police (AFP) on Thursday in relation to the threats and is taking the matter to Victorian State Premier Daniel Andrews as well as federal parliamentarians. Lim said he was “astounded” that Hun Sen could make comments like this on the eve of a visit to another country, but that in Australia, the Cambodian PM seemed to get away with everything. “It looks like Australia is now being blackmailed, or held hostage — it’s my way or the highway,” he said. 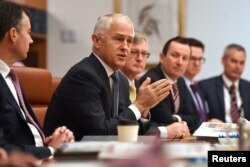 FILE - Australian Prime Minister Malcolm Turnbull speaks to state and territory leaders during a meeting of the Council of Australian Governments at Parliament House in Canberra, Australia, Oct. 5, 2017. Only a few refugees in several years have been resettled under a controversial deal with Cambodia in exchange for tens of millions of aid dollars. Observers regularly suggest the deal is muzzling Canberra from speaking honestly about rampant human rights abuses and corruption under Hun Sen’s regime. Rather than seeing Hun Sen’s visit as an honor, Lim characterized it more as an “embarrassment” for Australian Prime Minister Malcolm Turnbull’s government. Canberra’s relationship with Phnom Penh is further complicated by the latter’s influence on in its long-term ambition for ASEAN membership and recent efforts Foreign Minister Julie Bishop has made, under domestic pressure, to secure the release of an Australian filmmaker charged with espionage in Cambodia. 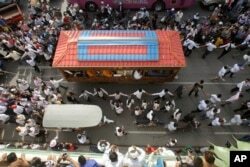 FILE - Mourners march along the decorated vehicle loaded with the body of Cambodian prominent political analyst Kem Ley during a funeral procession in Phnom Penh, Cambodia. Australia has also just accepted as refugees the wife and family of slain Cambodian political activist Kem Ley, a hugely popular figure who was assassinated in 2016 in what many in the country consider to have been a state-sponsored hit. The Australian Department of Foreign Affairs and Trade and the Australian Embassy in Phnom Penh did respond to VOA requests for comment. The Australian Federal Police told VOA they had yet to receive a referral regarding the issue but would evaluate the situation in accordance with standard procedures if they did. Carl Thayer, an emeritus professor and the University of New South Wales and a regional expert, said Hun Sen’s threat could be seen as “ an incitement” as information was surfacing that Phnom Penh was orchestrating a counter protest for the summit. “Well, look, you know I think that obviously the federal police will have to listen and evaluate threats to Australian citizens and I think that the threat there is not that Hun Sen would do it but some of his supporters in this country,” he said. “I’m told there is an attempt to organize some sort of pro Hun Sen activity to counter what’s going on,” he added, stressing details were very vague. Another assertion by the Cambodian premier, that his absence would invalidate any ASEAN consensus at the Australia summit, was not true, Thayer said. Hun Sen could, however, wreak havoc on Australia’s attempts to foster closer ties with the association by rallying members against them, he said. The Cambodian premier’s family has courted controversy during several recent trips abroad. During a 2016 trip to the United States, his son Hun Manet was confronted by protesters everywhere he went and forced to pull out of one event while his bodyguards were accused of assaulting a process server attempting to hand them legal papers at another. Later that year when he traveled to Australia, his reception from the local Cambodian community was equally frosty. This week Germany announced that preferential visas had been punitively withdrawn from senior Cambodian officials, including Hun Sen and his family. The Financial Times has reported that EU Council Conclusions set for Monday will warn of a possible rollback of Cambodia’s duty and quota free access to their market and request enhanced monitoring of it. Moves in the United States are underway to impose targeted sanctions against members of Hun Sen’s regime including asset freezes.